As digitalization revolutionizes customer behaviour, consumer industries need to act fast to meet the expectations of digital consumers. 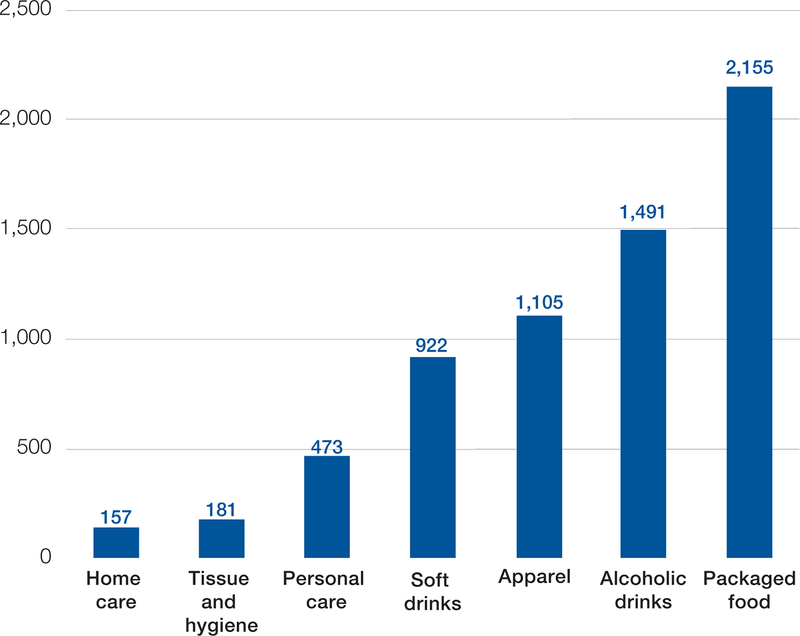 Consumer industries touch people’s lives in a way that few other industries can match. Every day, 2 billion people – almost a third of the world’s population – use the products of just one global consumer products company. During the 20th century, a major innovation in consumer industries was the elevation of products from mere commodities to differentiated brands. In the 21st century, it is the digital revolution that is driving the transformation of consumer industries, which encompass segments such as food and drink, personal care and apparel. Major demographic, technology and ecosystem trends are propelling this transformation, creating new risks and opportunities for consumer businesses. Digital innovation is shaking up consumer industries: shifting power from brands to consumers, shifting value from traditional players to digital insurgents, and putting the consumer in the driver’s seat. Mobile, social media, analytics and cloud have fundamentally shifted the way consumers buy and use products and services. This has led to important innovations in areas such as payment technology and last-mile delivery. Thanks to their position at the forefront of digital innovation, consumer businesses are now sailing further ahead into uncharted waters. Data can propel innovation and improve customer experiences. While developing data monetization models, companies must keep privacy and transparency issues in mind. Driven by data, products will evolve into services, and services into experiences. Revenue could be decoupled from output and more closely linked to outcomes for individuals and society. With online purchases growing, omnichannel strategies will play an important role as consumer products companies compete in a ‘flatter world’. Smart supply chains and factories will enable the mass customization of products and omnichannel experiences. Managing consumer experiences will be key to gaining a competitive advantage. Our value-at-stake analysis is a quantitative model that aims to assess the cumulative value impact over the next 10 years of digital transformation initiatives on the consumer industries, their customers, society and the environment. These digital themes are expected to put a cumulative $4.9 trillion of value at stake for the consumer industries in terms of operating profits from 2016 to 2025. This is approximately 14% of the total operating profits of the industry over the same period. The economically measured impact to society and consumers from the digital themes is estimated to be around $5.4 trillion. The total industry value at stake driven by this theme is estimated to be close to $900 billion. Around $700 billion of the business value at stake consists of value migration as firms that are more effective in leveraging data to create personalized marketing exposures and firms that are able to strengthen their brand image around the concepts of data privacy and transparency become preferred suppliers for consumers. Approximately $200 billion of business upside is attributed to value addition in the form of better pricing for differentiated offerings, reduced costs of product design and greater efficiency in the marketing function. The quantifiable societal impact from these initiatives amount to around $20 billion. However, there are significant contextual benefits that may not be quantified but would vary on a case-to-case basis. Some examples include water conservation for beverage companies; reduced wastage for fashion and apparel companies; and reduced use of artificial substances in food products. Efforts made by consumer goods companies and retailers to enrich the experience of consumers throughout their journey of purchase and consumption has put approximately $1.3 trillion of business value at stake while generating a societal impact of more than $450 billion. Close to $900 billion of business value is at stake from the substitution of traditional products and retail experiences by digitally enriched offerings. At the same time, better pricing, service revenues and increased demand could create around $400 billion in value. The value for customers and society add up to more than $450 billion. Consumer benefits are driven primarily by time savings in their purchase journey at a cumulative 40 billion hours. To the extent that the theme enables consumers to reduce unnecessary spending, we anticipate a smaller environmental footprint thanks to a decline in demand for goods that are sold but do not drive utility for consumers. 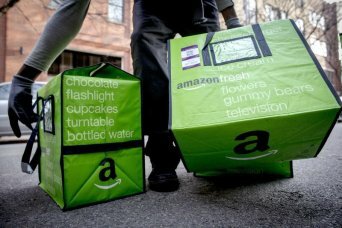 The migration of business from offline to online channels, the evolutionary response of some physical stores to survive and grow in the digital age and the proliferation of the sharing economy enabled by digital marketplaces is estimated to put $1.5 trillion of industry value at stake. Close to $900 billion of industry value at stake is attributed to the substitution of purchase channels from traditional retail to omnichannel experiences. The rest is credited to increased volume growth, and value created by new marketplaces, platforms and shopping applications. This theme has the most significant impact for society at around $4.9 trillion. It is driven primarily by time savings (300 billion hours) from online shopping, particularly in travel time, and cost savings attributed to online discounts, lower-priced used goods and rental services. Greater e-commerce penetration is changing the retail landscape, handing pricing power from manufacturers to online retailers. It is also levelling the playing field, helping smaller and niche players compete against the dominant large brands. E-commerce has a potential societal impact of $2.7 trillion as it reduces commute time by more than 250 million hours and gives access to a broader variety of products and (discounted) prices. 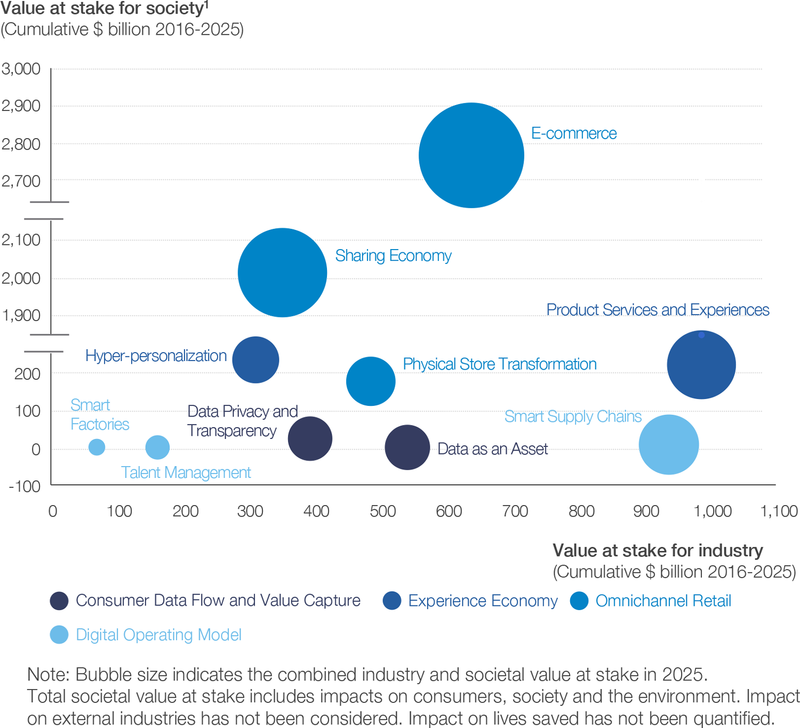 B2B and cross-border platforms could further increase e-commerce’s societal impacts. The companies that leverage automation, connectivity and intelligence in supply chains and that invest in digital tools to recruit, manage and train their workforce in an environment of digital skill shortage could generate an industry value impact of around $1.2 trillion. More than $1 trillion is attributable to smart factories and supply chains with benefits driven from improved productivity, reduced logistics costs, and lower procurement and inventory costs. The efficiencies in operations also benefit the environment with lower energy footprint and emission reductions of around 160 million tonnes, driving a societal impact of close to $10 billion over the next 10 years. Around $150 billion could be attributed to value creation by companies that succeed at leveraging digital in talent management with lower recruitment costs, lower attrition levels and improved productivity of a digitally skilled workforce. The success of digital transformation will hinge on the success of consumer companies in innovating while maintaining the trust of their customers. Digital transformation will benefit the environment through the efficient use of resources, decreased energy usage and reduced wastage. It will also impact society by generating employment in new fields – which will require efforts to retrain and build the skills of the workforce – and by creating and propagating a wellness culture, leading to better health outcomes. Looking to the future, consumer industries need to think deeply about what digital means to them and what problems digital can help them overcome. Irrespective of the path that businesses choose to take, there will be ‘no-regret’ investments that can be made to survive and thrive in the future. Our recommendations for these investments include breaking down traditional organizational barriers, building ecosystem partnerships, investing in skills and digital capabilities, and building an omnichannel presence.